Custom ribbon cutting scissors add an important layer of exclusivity to a ribbon cutting. Printing or engraving logos and text onto ribbon cutting scissors creates a marketing opportunity during your ceremony as pictures of the cutting will capture your brand in the midst of a triumphant moment. Grand openings and groundbreakings present the perfect opportunity to hold ribbon cuttings with personalized scissors because the launch of a new project can benefit greatly from any promotional practice that helps to establish a brand. There is something about print that promotes credibility, more so than verbal communication. Seeing the name of a company, its logo or slogan printed or engraved on the shiny metallic surface of a pair of giant scissors solidifies the public’s perception of the company as a trusted brand. Ribbon cutting ceremonies are a time-old tradition in business that has evolved from a simple demonstration using basic scissors and ribbon to a high profile event employing giant decorated scissors to cut an extra wide ribbon. Being the main tool used in the ceremony, the scissors are always at the center of attention—along with the ribbon. Out of this inevitable visibility grew the idea of customizing the scissors’ appearance with different shaped blades and handles in various colors and metal materials. Eventually, that customization expanded to include larger sizes and unique personalization like the logos, names and messages that are seen today; pretty much anything that maximizes the opportunity of having all eyes on the scissors. Not only are custom scissors used to perform the ribbon cutting but they are also used as a marketing opportunity that lasts long past the event. Through pictures and video, custom personalized scissors have the opportunity of being seen at any point in time, especially thanks to digital media and social networks on the internet. However, there is another way that custom scissors make an impact beyond the event date and that is through displayed preservation. Ribbon cutting scissors are ideal keepsakes that may be displayed in special shadow box cases or mounted on ceremonial award plaques. The point of preserving them is to commemorate the important day of the project kick-off or business launch. Key figures in the ceremony usually have a personal interest because a ribbon cutting for a grand opening or groundbreaking can bring a sense of pride. The customized scissors are a trophy of personal achievement for the top individuals involved and they are showcased as such. Scissors in these cases or plaques can be hung in conspicuous spots at the place of business for everyone to see. The personalization helps remind the public of the solid foundation of the company from the very beginning since ceremonial events are usually held by serious businesses that care about their reputation. As mentioned earlier, customization as simple as adding a logo, company name and/or slogan to a pair of shiny giant scissors can go a long way as a PR/marketing tool. Those are the basic suggestions when it comes to personalization, but there are many possibilities that have the same or even greater results, depending on your intention for personalizing. The blank blades of the scissors can serve as a canvas to customize any message (as long as it fits the printable/engravable area). It could be a company motto, a special dedication or the dated information about the event itself. In our catalog, we even have pre-printed scissors with text that may be paired up with a logo to complete an ‘express’ customization. Custom ribbon cutting scissors truly allow you to add a unique mark to your ribbon cutting ceremony. 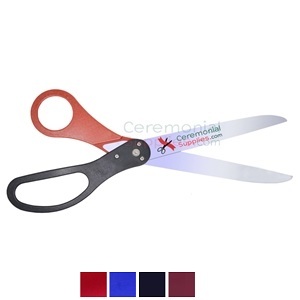 Personalization is the key to a memorable event; CeremonialSupplies.com is the best place on the internet to create those memories with custom scissors that promote your brand and help establish trust. Contact us directly for any questions regarding our customizable ceremonial scissors.